Ability to define project budget as tasks are defined. 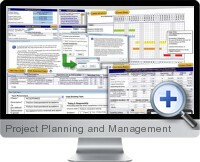 Pre-define project phases, task titles, holidays, and other key project parameters. Creation of task dependencies and timing constraints. 'Auto-timing' function calculates optimal project schedule automatically. Gantt scheduling chart with embedded task information. Project status reporting based on best-practice Earned Value Analysis. Compatible with all versions of Excel for Windows as well as Excel for Mac as a cross platform project management solution. More resources for the Project Planning and Management template including video, user manual and support can be found on the Excel Project Management Template page. Being used during the trial and really looks smart. The point is that it can be as complex as you'll need, getting a good approach to easy solutions. After reviewing several options to expensive project management software, Business Spreadsheets Excel Project Management template proved to be the best - and it wasn't even close. It's incredibly in-depth, yet easy to use. I highly recommend Business Spreadsheets and their products to anyone. This project management template is a great tool and easy to use. I have looked everywhere for an Excel based program that would help me manage projects.This sheet has it all and is working great with Resources, Scheduling, Tasks and not to mention the budgeting and cost portion. I would highly recommend it. The Excel project management template is the best project management spreadsheet I have found after testing and reviewing several other (higher priced) solutions. They have created a simple and easy to use spreadsheet that has a lot of features. It has helped me with a very difficult task of keeping all of our projects and employees organized. A must have for any business that needs to keep track of projects and keep them flowing.